Robert Rosenberger is an assistant professor of philosophy at the Georgia Institute of Technology. He studies the philosophy of technology, exploring topics such as Mars imaging, computer-simulated dissection, and cell-phone-induced driving impairment. His writing has appeared in academic journals, such as Science, Technology & Human Values, Phenomenology & the Cognitive Sciences, and Communications of the ACM, and popular venues such as Slate and The Atlantic online. H.W. 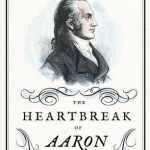 Brands’s The Heartbreak of Aaron Burr lays out the details of Burr’s lifetime in short, swiftly moving chapters.